BlackSmoke CCFL Halo Headlights w/Daytime Lights 09-18 DODGE RAM Spyder Black Smoke CCFL Halo Headlights w/Daytime Lights 09-18 DODGE RAM, Black Smoke CCFL Halo Headlights w/Daytime Lights 09-18 DODGE RAM, Projector Black Smoke Headlights 09-18 DODGE RAM, Black Headlights 09-18 DODGE RAM, Black Headlights 09-18 Ram, [Spyder 5078810 Head Lights] - $399.95 : 3rd Strike Performance, Your Source for Late Model MOPAR Performance Parts and Accessories! CCFL is the oldest halo lighting technology. It produces a smooth glow that a lot of customers really like. Unlike LED lights you can't see a bunch of individual lights on the ring. The notable disadvantage to CCFL is that it is not as bright as LED or Plasma. Built to last through 100,000 hours of continuous use. 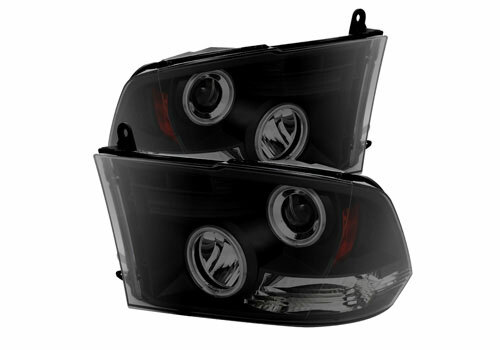 Add style and function to your Dodge Ram with a new set of Projector Headlights from Spyder Auto. These lights illuminate the road better and allow you to have a safer more enjoyable driving experience at night. Not only does it help illuminate the road but it looks great doing it. The lights are constructed of and OEM ABS composite that meets and exceeds DOT strict standards for on road use. Installation is fast and easy thanks to the simple bolt on design of the lights. Installation can be done in your driveway with the help of some common hand tools. Comes with detailed instructions and everything needed to install your new custom headlights from Spyder. Minor wiring is required for proper installation. Help your Dodge Ram turn heads while adding extra light to the road with this great looking set of Projector Headlights from Spyder. The Projector Headlights come in many different style as well as finishes to suite your own personal style ensuring you get the best look for your ride. Get your new set of custom designed headlights today and see what the road like never before with set of Projector Headlights from Spyder.